After many years on Blogger, we have moved our company blog to a new space. We hope you will continue to follow our journey and subscribe to our new blog! SeeClickFix's Citizen Relationship Management Suite (CRM) has grown substantially over the past year and a half, quickly becoming an integral part of our municipal partners' everyday workflow. The idea behind it is simple, we automate as much as possible and for everything else we built an efficient non-technical user interface. Below is a few of my favorite features the SeeClickFix CRM has to offer. The most recent addition to our CRM called Insight is far and beyond my favorite. 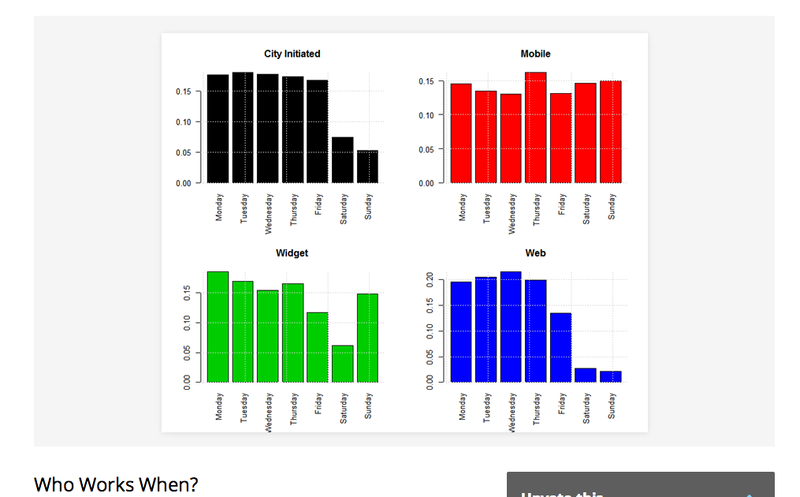 Currently being beta tested with a few select cities, Insight makes it simple to pour through serious amounts of data to create charts and graphs highlighting everything from trends over time to the volume of reports. The simple act of attaching images is a long standing municipal innovation that the SeeClickFix mobile app brought to the table. Often taken for granted these days, attaching a photo to service requests decreases the issue resolution time substantially. The heat-map is one of the fastest and easiest ways to visualize geographical data on a map. 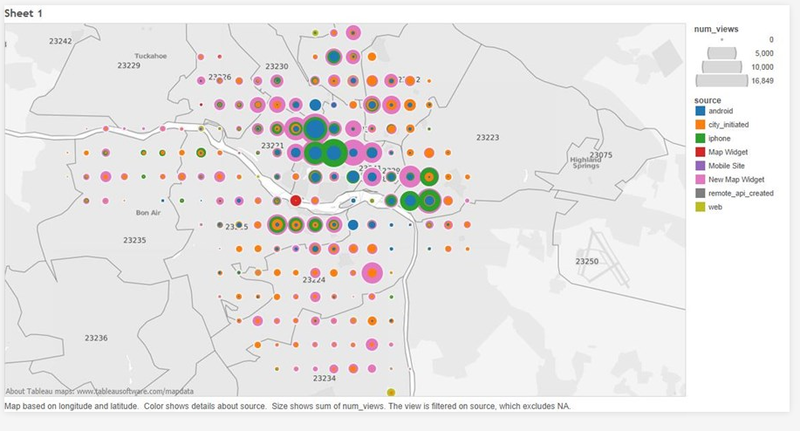 Shown below is the density of graffiti reports in Washington DC. It's not all that surprising but if you notice at the bottom of the map, vandals tend to steer clear of the White House. Last but not least we have Google Maps. This is the ultimate in user friendliness for non-technical users. With integrated features like Google Street View it's easy to check out where you are going before you leave the office. Thats my list, there are a lot of other features in our CRM but that's a quick snapshot of my favorites. Randolph, MA in the Top 10! This week an article was posted on Wicked Local Randolph about the town cracking the top 10 of our List of Top Performing Cities. A long time ago our Co-founders came up with an algorithm (below) to allow smaller cities like Randolph and #1 ranked Tontitown (pop. 2,548) to compete with Chicago and Albuquerque (also in the top 10). "We are using technology, data, and accountability, to improve our performances across the spectrum of government services. Our scores are positive, but we can always do better." Residents saw it, clicked it, and got the services they needed as part of a national program designed to help municipal departments be more responsive to problems when they arise. The town ranked ninth in the country in the time it took to respond to requests by residents for municipal services. The top town was Tonitown, AR., while Malden came in third. Randolph has logged 1,535 calls for municipal services that translated into 211 results. On January 1 SeeClickFix and CTNext welcomed the first three SeeClickFix Fellows. Michael Kaufmann, Steven Young and Andrew Williams joined the SeeClickFix team for 6 months. During the day they work on the other side of the office from their core competencies, engineers working in biz dev and vice versa. At night they work on their products. We are two months into the fellowship. There are 4 months left in the fellow's nights and weekend runway. After that they have been kindly offered a home at New Haven's co-working space, The Grove where they will likely continue to grow their products and figure out how to support themselves financially. Andrew Williams hails from Virginia but now calls #NHV his home. Steven comes from San Francisco as Andrew's engineering half at http://www.PlacingLiterature.com. 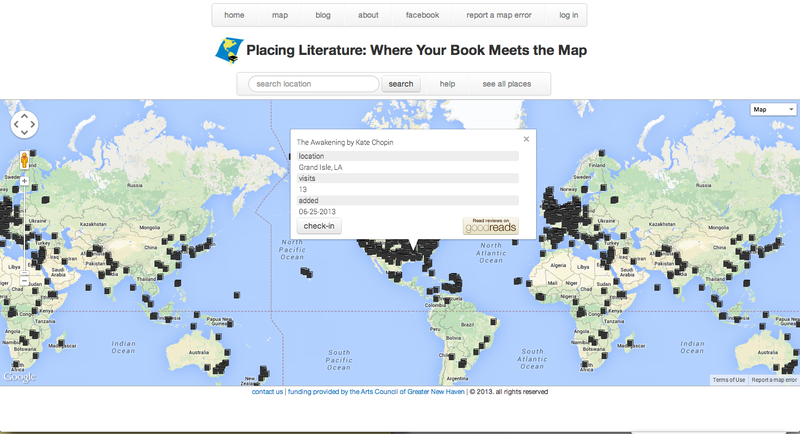 Placing Literature is a crowdsourcing website that maps literary scenes that take place in real locations. There are 1350 places mapped in the first six months and their core focus during the fellowship is making the database more robust. This is the first time the founders are living in the same city while working on their startup. Mike Kauffman is developing MoVi Interactive, an innovative tech firm specializing in wearable technology and the user experience. MoVi creates applications that leverage data captured by physical sensors such as Fitbit, Nike FuelBand and Jawbone Up- to name a few. The flagship application, Fitness Faceoff, is the first full-blown fitness strategy game and is set to release in March. We are loving the prototype designs of Fitness Faceoff at SCF and are excited to see the beta to be launched in March. 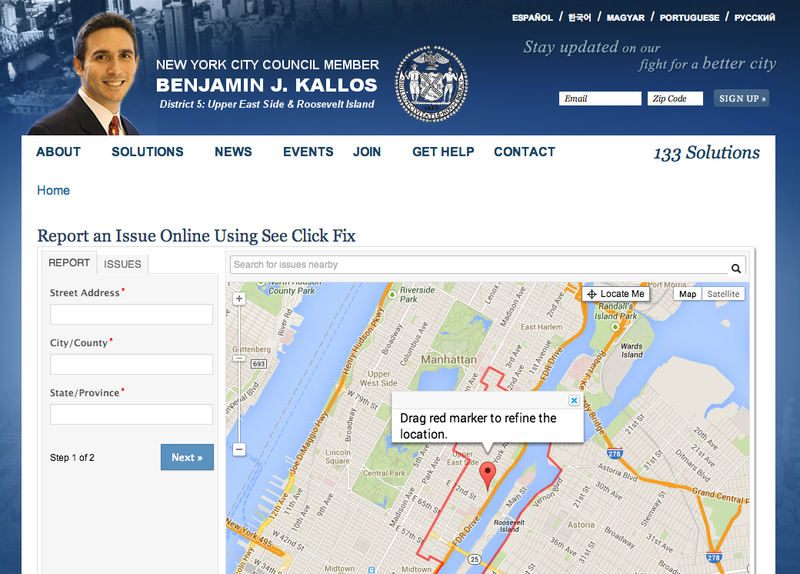 Council Member Ben Kallos is leveraging web tools to connect with citizens in NYC's 5th District. 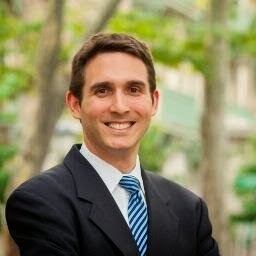 Kallos recently announced that his team has added a SeeClickFix widget to the Councilman's website at benkallos.com/seeclickfix where citizens are able to input service requests. These requests are monitored directly by Kallos' staff, who are excited to be up and running with the SeeClickFix CRM. Kallos feels that the 5th District will play an important role in bringing citizen engagement tools like SeeClickFix to the rest of New York City in the near future. I came across this request in Holyoke yesterday, and wanted to share it as a great example of one of the thousands of positive customer experiences we see delivered by our municipal partners. Thanks for using SeeClickFix. With pothole season upon us SeeClickFix HQ is buzzing with excitement. Every Spring we see a considerable spike in citizen engagement platform wide. Our CEO Ben Berkowitz is famous for saying "potholes are the gateway to citizen engagement" and as the data shows he is spot on. We are all looking forward to see what municipalities have in store for their citizens this year! Last year Chicago had some fun instituting the first annual "Potholepalooza" encouraging citizens to get out there and report potholes using the SeeClickFix app. Tired of Drivin ‘N Cryin’ in Traffic over the Minor Threat of potholes in the Pavement? Ready to see nothing but The White Stripeson the roadway and not worry about The Cars swerving to avoid potholes? Champaign Illinois is off to an early start with an article published a few weeks ago informing citizens on how those annoying potholes are created and how SeeClickFix can help. When Champaign residents see potholes around town they can take advantage of the public works’ department’s app SeeClickFix. The app, which launched last year, allows people to take photos of the problem. Then, it geolocates where the photo was and adds it into the database to be fixed, said Champaign Public Works public information officer Kris Koester. The resident who submits the photo will receive a notification when the request is added into the database and when it is fixed. 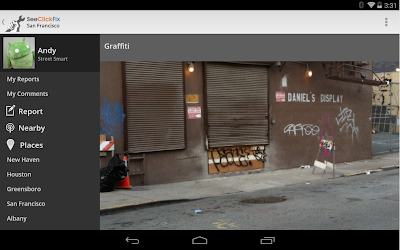 The graffiti related frustrations that sparked the founding of SeeClickFix have been well documented. Our CEO, Ben Berkowitz, has told the story at least a thousand times. He encountered difficulties when he tried to report graffiti to his local municipality and felt compelled to take action. Ben and the co-founders created SeeClickFix to help address the friction points that arise in the realm of non-emergency complaints. PBS News Hour: "Ben Berkowitz's Formula: Spot a Problem, Map It, Fix It"
Polis Blog: "Interview with Ben Berkowitz of SeeClickFix"
CT Business Journal: "Innovator of the Year: Ben Berkowitz, SeeClickFix - Power to the People"
Just last month, SeeClickFix processed 8,573 graffiti requests. The majority of them are handled in the manner of Issue # 946126. The reports are dispatched and the problems are fixed. Let's celebrate those who are keeping the trains running on time. Thank you to the City of Albuquerque for fixing that issue and to the hundreds of other SeeClickFix partners who are responding every day. data to try and produce the best model in order to win. understanding of what these data gurus have in common. Below are some of the top findings. percent of the top 100 performers on Kaggle have a Master’s degree or higher. Computer science and mathematics are the main areas of study by the top Kaggle performers. data scientist aren’t necessarily tied to a specific background. make a positive social change in the world (and gain some extra cash!). Ran Locar - Tel Aviv, Israel, for Who Works When? In support of Open Data Day, SeeClickFix and Socrata are collaborating to provide the SeeClickFix Socrata Download tool through February 24, 2014. We are excited to see how participants use and visualize the data in new and different ways. "The platform allows the state to provide a common mobile phone app (iPhone, Android and other smartphones) for reporting non-emergency issues that are automatically routed, by location and issue type, to the correct municipality, department or team responsible for fixing it." "Over the last year, more than 16,000 issues were reported and resolved across 57 communities in Massachusetts through the statewide program, Commonwealth Connect. 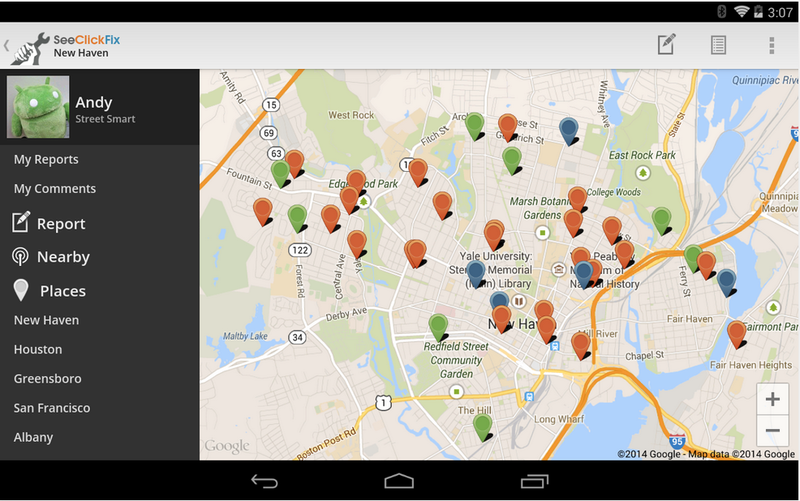 The program, developed through a partnership with the City of Boston and New Haven-based SeeClickFix, allows residents to report issues through their mobile devices and automatically geo-map and route reports." A number of folks are hosting International Open Data Day around the world and we're excited to be the host in our home town of #NHV. 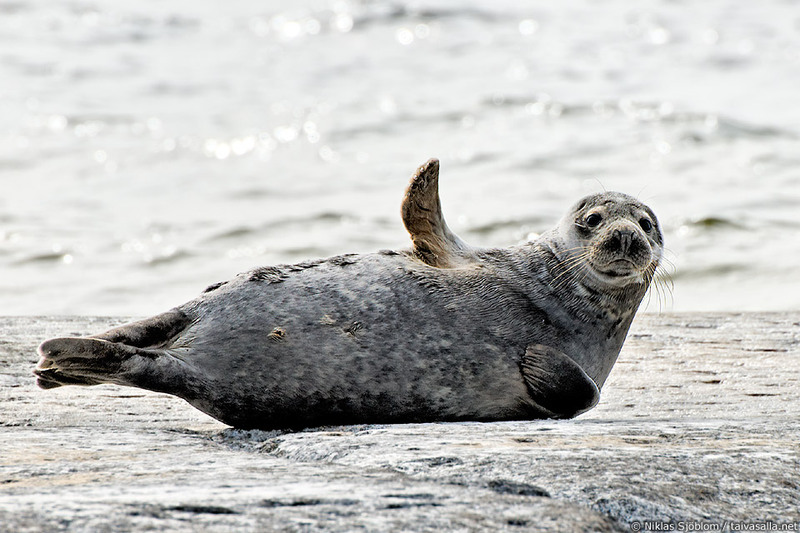 The SeeClickFix API is available at http://dev.seeclickfix.com. We've heard ideas for building apps like Snowcrew.org on top of the API that lend context to certain types of service requests. We've also heard ideas for location aware apps that react to SeeClickFix data. In the past we have seen predictive algorithms and visualizations and we hope that we see more of these as well. In one case we have even seen an entire mobile application with near feature parody to in-house SeeClickFix apps built in Romania. If you are near New Haven and have technical chops join us this Saturday. For more info about the International Open Data Hackathon, visithttp://opendataday.org. For a list of events occurring on this day worldwide, see the wiki listing at http://wiki.opendataday.org/2014/City_Events. Last week Ben Schiller at Fast Company interviewed us about some of our favorite issues from 2013. 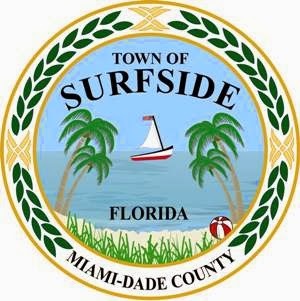 We are pleased to announce that our latest municipal partner is the Town of Surfside, Florida! They're rolling out our hosted government CRM platform to departments across the board, from Public Works, to Parks and Recreation, to Code Compliance. Sunny weather, sandy beaches, and now SeeClickFix: Surfside, what's not to like? We look forward to partnering with other cities, towns, and villages in Miami-Dade County in 2014. Snowcrew.org Launches in beta on top of the SeeClickFix platform. Roooar!!! Last week Snowcrew.org launched in private beta with newly knighted Yetis signing on their friends and neigbors to volunteer shoveling assistance to the elderly, injured and disabled. The day after Snowcrew went into private beta Yetis were called into action in New Jersey. Nancy Tilford asked for help shoveling in Sussex County. Seven Yetis rushed to her and her husband's aid validating the Snowcrew platform and prompting the tool out of private beta into beta. There are still known bugs that the Snowcrew team is squashing but you can start growing your grew. 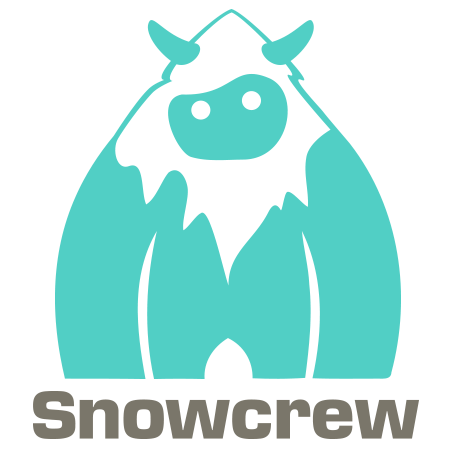 374 Yetis have signed up in the last few days and today Snowcrew announces its beta launch. If you are physically unable to shovel and need assistance please sign-up for Snowcrew to request assistance from a neighbor. If you want to help out today in the storm you can bring up Snowcrew.org and find requests nearby from neighbors who need a hand. Every new user is given an ordered Yeti id and a referral link that you can share to help build your crew. More features to come but Snowcrew hopes you enjoy this early release. We're very excited about this civic expansion on top of the SeeClickFix platform. If you want to build an app on top of the SeeClickFix API contact us and we'll help you get started. The New Haven Register has a bit more of the Story on Snowcrew thanks to Helen Harvey, Staff Writer at the Register. This week Sacramento 311 announced their new mobile app provided by SeeClickFix. 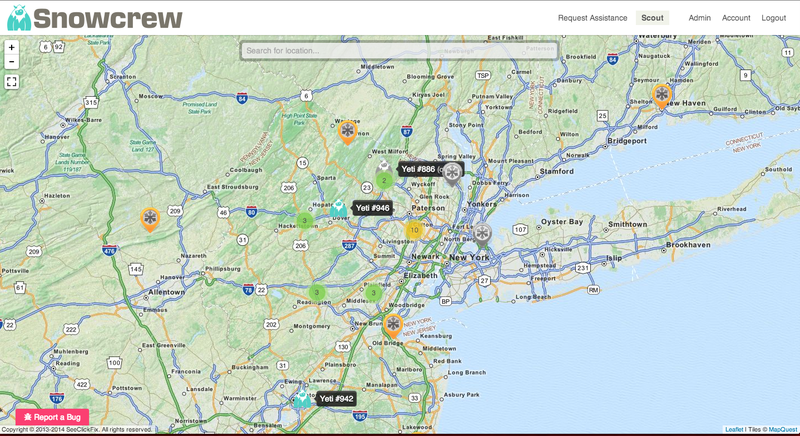 The solution provides for different service request types based on the geo-dynamic location of the report. This gives the county flexibility in their service request offering that they didn't have previously. Over one year ago, the Patrick Administration, the City of Boston and SeeClickFix announced Commonwealth Connect, a program that allows municipalities and constituents in Massachusetts to communicate about and quickly resolve non-emergency issues. The flexible nature of the SeeClickFix platform allows for an issue-management solution that is adaptable across municipal governments of varying sizes, locations and demographics. The small island and beach community of Nantucket has found the service to be equally, though differently, impactful as Randolph, a mid-sized city with a high number of city-initiated requests. In reflection of the success of this program, I used Insight, a new, interactive reporting mechanism designed by SeeClickFix, to extract data and highlight a statewide victory. These numbers and graphs draw attention to high levels of engagement by both Massachusetts’ residents and city employees. Municipal governments have actively addressed a large portion of reported issues. The overall increase in closing issues echoes the increase of new reports. Impressively, 86% of the nearly 17,000 issues reported through the program have been resolved. We have been impressed by the results of this program and know that its success can be credited to many – the Patrick Administration, the City of Boston, the SeeClickFix team, and of course, the Massachusetts municipalities and residents. This is the first of the three-year grant, and we look forward to expanding and strengthening the Commonwealth Connect program in the subsequent years. 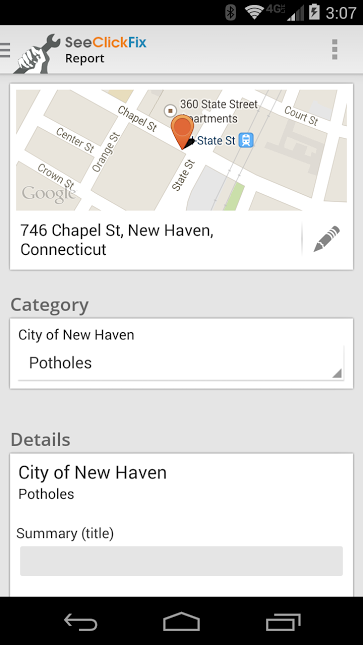 New Haven, Conn., January 15th, 2014 - Today, SeeClickFix released a native app for Android that allows citizens to report neighborhood issues--such as potholes, graffiti and burned-out streetlights--and engage with their neighbors and the government officials responsible for fixing/addressing these issues. "The Android extension has become a top priority over the past six months due to consumer and government behavior on the platform," said Ben Berkowitz, CEO, SeeClickFix. "We've seen from our users that local government employees are more likely to be carrying a government issued smartphone or tablet, with many on the Android OS. We saw issues created by government officials increase by 600 percent in 2013, indicating that smartphone reporting apps are becoming a popular medium for increasing municipal productivity and citizen engagement." Users have access to an infinite scrolling list of issues documented in their community—complete with photos, location and the ability to comment and support existing issues. Government users can acknowledge and close out issues that they have worked on from the field. When documenting a new issue a user's location is determined by GPS and they are walked through an intuitive issue reporting form determined by the responding agency in their community. 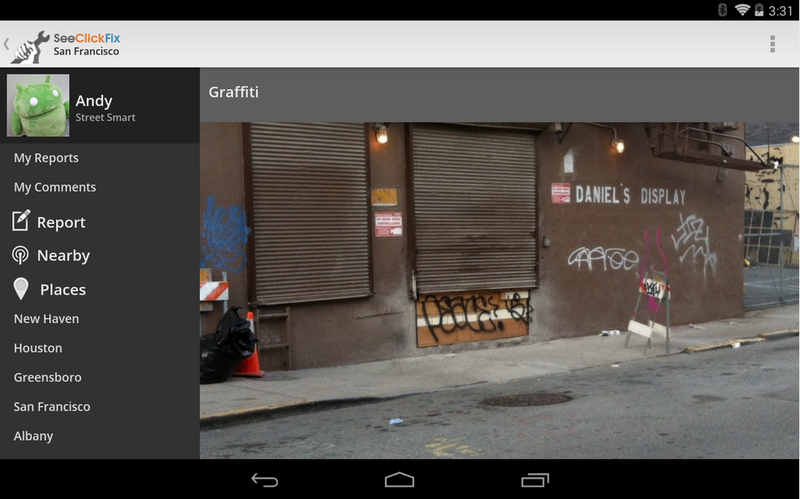 Photos and videos can be added from the camera or gallery to illuminate the issue. Once an issue has been submitted, it is routed based on request type and keywords to the appropriate agency. Responses from the agency and others are then documented on the issue and pushed back to the user. SeeClickFix serves as an unofficial channel for citizens and governments to communicate in more than 10,000 communities around the world. In the past few years the platform has also become the official service request platform for local governments serving over 25 million individuals. Official city partners include Washington DC; Houston, Texas; San Francisco, CA; Oakland, CA; Sacramento County and The Commonwealth of Massachusetts. The new Android application is available for download here. We are currently looking to hire two (2) high-energy and driven Account Executives with knowledge of technology, solid business-to-business or business-to-government sales and experience in closing new business. You will be selling our hosted CRM and citizen engagement solution to municipal, utility and educational verticals within a defined prospect territory. This role is strategic to our long-term growth and provides tremendous upside. SeeClickFix offers a fast-paced, start-up environment. Our goal is to build an organization of smart, ambitious New Business Account Executives, committed to our mission and focused on success. A Warm Welcome to Windsor, CT! 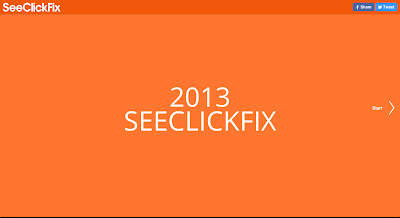 The SeeClickFix team is happy to share our first client launch of 2014! This week, the Town of Windsor in our home state of Connecticut officially announced SeeClickFix to residents as a key part of their initiatives to enhance customer service and engage with citizens around current issues in their community. Our hosted platform has been rolled out across multiple departments in the town, meaning that residents requests from potholes to broken playground equipment will be quickly and easily processed and responded to by Windsor's staff. 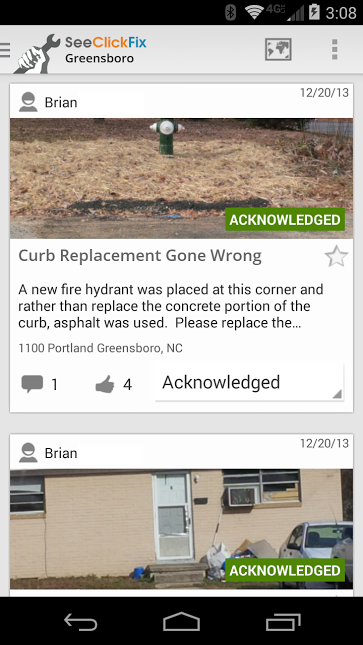 Residents can report issues directly through the town's website, as well as through the SeeClickFix app for iPhone and Android. Windsor's new initiatives are already making waves and capturing the attention of local media in their area. 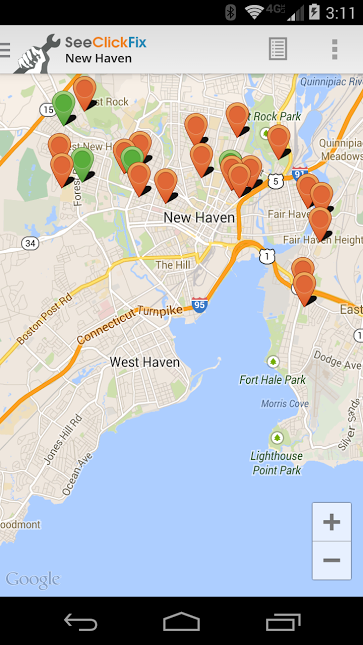 Read more about how the Town of Windsor is using SeeClickFix on the Hartford Courant and on the Windsor Patch site. This morning, Ben Berkowitz appeared on FoxCT to discuss the ways in which SeeClickFix has helped transform cities and communities in Connecticut, across the country, and around the globe. Check out the video and textual responses to additional questions here!